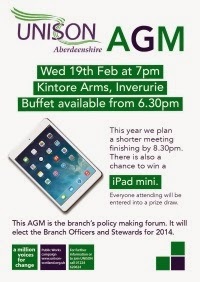 All Branch members are invited to attend the Annual General Meeting of the Aberdeenshire Branch of UNISON on 19th February 2014 from 7 – 8.30 p.m. at the Kintore Arms, Inverurie. Click here for a poster. Please print off and put up in your workplaces. Inez Teece, Branch Secretary said, “Whether we work for Aberdeenshire Council, a related employer or the voluntary sector, we have all had the challenge of change over the past year. “Terms and Conditions, Pay, Pensions and the impact of Service Reviews have been the major issues we have faced. “This year there is also a chance for one lucky member to win an iPad Mini in the AGM raffle. All attending members will get a raffle ticket and the winning ticket will be pulled out of the hat at the end of the meeting. “A buffet is available from 6.30 p.m. and members of the Branch Committee will be on hand to answer any questions or just to chat.